Our DC-Com chain hoist is the right choice for everyday needs: designed for applications with normal requirements – simplicity and reliability in proven Demag quality. DC-Com units can be integrated into the rails of our KBK light crane system or installed on I-beam girders – where our U 11–U 22 generation of trolleys provides smooth transport of your loads. And what else do they offer? This Demag DC Com 5-500 1/1 H5 V5.4/1.3 230/60 2-speed Electric Chain Hoist has a 16-ft. lift and co.. This Demag DC Com 5-500 1/1 H5 V5.4/1.3 460/60 2-speed Electric Chain Hoist has a 16-ft. lift and co.. This Demag DC Com 5-500 1/1 H8 V5.4/1.3 460/60 2-speed Electric Chain Hoist has a 26-ft. lift and co.. This Demag DC Com 5-500 1/1 H5 V5.4/1.3 575/60 2-speed Electric Chain Hoist has a 16-ft. lift and co.. This Demag DC Com 10-1000 1/1 H5 V4.8/1.2 230/60 2-speed Electric Chain Hoist has a 16-ft. lift and .. 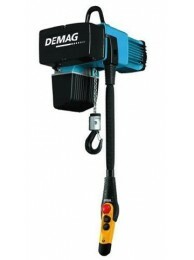 This Demag DC Com 10-1000 1/1 H8 V4.8/1.2 230/60 2-speed Electric Chain Hoist has a 16-ft. lift and .. This Demag DC Com 10-1000 1/1 H5 V4.8/1.2 460/60 2-speed Electric Chain Hoist has a 16-ft. lift and .. This Demag DC Com 10-1000 1/1 H8 V4.8/1.2 460/60 2-speed Electric Chain Hoist has a 26-ft. lift and .. This Demag DC Com 1-125 1/1 H5 V9.6/2.4 230/60 2-speed Electric Chain Hoist has a 16-ft. lift and co.. This Demag DC Com 1-125 1/1 H8 V9.6/2.4 230/60 2-speed Electric Chain Hoist has a 26-ft. lift and co.. This Demag DC Com 1-125 1/1 H5 V9.6/2.4 460/60 2-speed Electric Chain Hoist has a 16-ft. lift and co.. This Demag DC Com 1-125 1/1 H8 V9.6/2.4 460/60 2-speed Electric Chain Hoist has a 26-ft. lift and co.. This Demag DC Com 1-125 1/1 H5 V9.6/2.4 575/60 2-speed Electric Chain Hoist has a 16-ft. lift and co.. This Demag DC Com 1-125 1/1 H8 V9.6/2.4 575/60 2-speed Electric Chain Hoist has a 26-ft. lift and co.. This Demag DC Com 2-250 1/1 H5 V7.2/1.8 230/60 2-speed Electric Chain Hoist has a 16-ft. lift and co.. This Demag DC Com 2-250 1/1 H5 V7.2/1.8 460/60 2-speed Electric Chain Hoist has a 16-ft. lift and co.. This Demag DC Com 2-250 1/1 H8 V7.2/1.8 460/60 2-speed Electric Chain Hoist has a 26-ft. lift and co.. This Demag DC Com 2-250 1/1 H5 V7.2/1.8 575/60 2-speed Electric Chain Hoist has a 16-ft. lift and co.. This Demag DC Com 2-250 1/1 H8 V7.2/1.8 575/60 2-speed Electric Chain Hoist has a 26-ft. lift and co..